Triton MultiRider Indoor Cycling Center – Program Starts January 18th, Sign Up Today, Reservations Limited! ﻿MultiRider Full House – Carmichael Training Systems, December 21, 2010. THIRD ANNUAL TRITON MULTIRIDER INDOOR CYCLING PROGRAM STARTS TUESDAY, JANUARY 18TH ! Ride with your teammates this winter and find out what the rest of the triathlon world is talking about! Check it out — http://bit.ly/fVxmNX and www.computrainer.com/RM_inc/VIDEO/Time%20is%20Money4.wmv. The Bozeman Triathlon Club operates the only MultiRider Indoor Cycling Center in the entire state of Montana. In its third year, and always sold out, the Triton indoor cycling program provides cycling training specificity, with power. Ride your bike, in the aero position, with your teammates, and train with power. Stay motivated this winter, have fun with your teammates, start base phase training, and plug into this incredible Club venue! Improve your cycling, and supplement your overall training program. Importantly, get ready for the 2011 triathlon race season. Once the program starts, the Grizzly Triathlon will only be three months away! TRITON COMPUTRAINER PROGRAM – Free – Single rider platform. As a sponsor of the Bozeman Tritons, 4800 Gym provides space for this Triton-owned equipment for Triton member use, free-of-charge, primarily during open hours. PROGRAM RESERVATIONS — To reserve your spot on the Triton MultiRider Program and make the necessary $180 payment, please contact Tony Thatcher by email at tony@dtmgis.com or bozemantritons@yahoo.com . These programs are available to Triton members only. Membership information is available at www.bozemantritons.org. 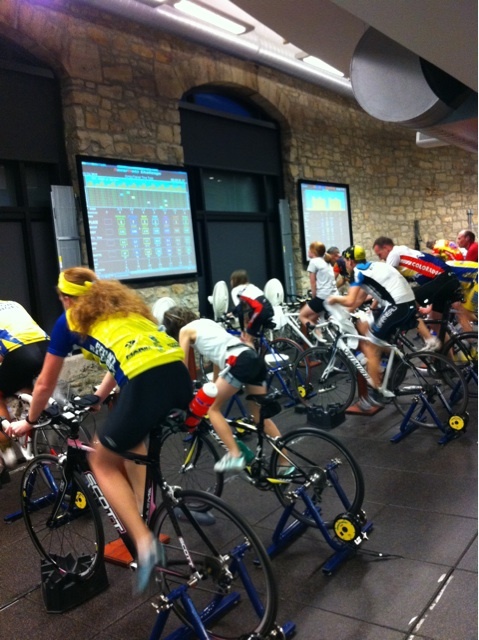 The Bozeman Triathlon Club thanks CompuTrainer and 4800 Gym for sponsoring the Club and this indoor cycling program. Additional information about our sponsors is available at www.racermateinc.com and www.4800Gym.com, respectively. We look forward to riding with you this winter! TRAIN ON.